Are you in love with 19th century PARIS? 1894 “Lumière sur Montmartre”, is 19th century French music, elegant and neo romantic piano & strings melody with contemporary orchestra and soprano voice for some CUES. It will suits perfectly 19th century themes of romantic love with a modern French touch. 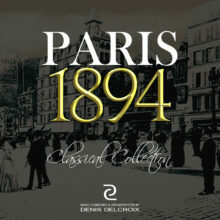 Moods: 19th French Paris Montmartre, Neo Romantic, Elegant, Playful, Sentimental, Cabaret, Belle Époque, Vie Parisienne, Dandy, Moulin Rouge, Berlioz, Offenbach, Brahms, Dvorak, Strauss.